Twin four-strokes add to the ultimate trailerable offshore fisher. The Voyager is unique amongst Seafarers in being a centre console with a full size double bunk inside. Seafarer simply call it a ‘walkaround’. 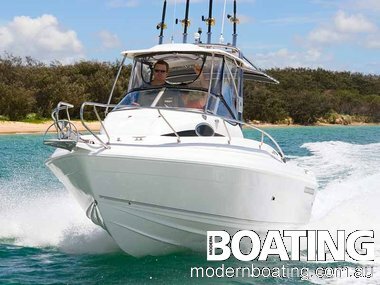 Our test boat measured 6.8m, its bare hull weighing in at 1.6t, and it cost, along with a quality trailer and the pair of 150hp Suzuki four-stroke outboard motors that powered it, just shy of $160,000. The Seafarer Voyager definitely lives at the higher end of trailerable boats. A big heavy boat, it isn’t trailerable by the average family sedan. And yet, given a suitable tow vehicle, the Voyager is trailerable, and even when compared to top-of-the-range imports around the same size, the Voyager can hold its own against any company at sea. And it’s still within legal width for towing in Australia, unlike some imported competitors. The Voyager also avoids falling foul of another common hassle among competitors which use a moulded hull liner to create cockpit sides, they jam your toes against slippery vertical surfaces; the Voyager doesn’t. Never one to compromise anything in rough-water fishing ergonomics, Seafarer’s Lindsay Fry dictated that the Voyager’s interior would utilise entirely separate deck and side-deck moulds, so essential leg support is available, and not just in the cockpit, but also along the sides of the walkaround vessel. The Voyager’s console/cabin is big enough to sleep two people comfortably. There are twin ‘drained overboard’ fish boxes set into the cockpit sole that would hold even a big Spanish mackerel or wahoo. Inside the helm area you’re sheltered from anything the weather might throw your way, especially if a hard version of the targa top is optioned. There’s room to go forward in comfort and safety beside the console/cabin to cast or handle ground tackle. Aft, a plumbed livewell comes standard with a second one optional. The deck is all non-slip ‘glass and easy to wash down with a standard high-pressure deck wash. Structurally, the hull is foam filled “a not-to-be-underrated safety feature” with the deck carried high enough to drain through big scuppers. Padded coamings around the cockpit are standard, as are clip-in carpets and a portable type toilet in the cabin. Fittings throughout are all quality stainless steel, and the standard fuel tank holds a whopping 340L. One of the first folding split aft-lounges seen in Australian boating graces the transom bulkhead and beside it a transom door is also standard. Rod racks along each side come standard, too. The options list is short: a power anchor winch, probably because many offshore fishing enthusiasts prefer to use buoys to raise the pick, the aforementioned hardtop, and a freshwater tank which again, only people intending multi-day trips offshore would choose. This is all well and good, and brings us to something radically different about our test boat. I’ve been to sea in several Voyagers over the years, most of them actually belonging to Lindsay Fry himself. Back in the straight two-stroke days, Lindsay built himself a succession of Voyagers, each of which featured more and more power. However, times have changed. Seafarer has been incorporated into the Haines family stable, and modern concern about emissions manifests itself in the growing popularity of four-stroke outboards. Our test Voyager came powered by a pair of 150hp Suzukis, so I was keen to compare how the different power delivery of today’s low emission outboards affected a hull I’ve loved for years. Twin-motor versions of the Voyager always came with an integrated half-pod arrangement, which broke new technological ground in its day, and interestingly Mr Fry’s crystal ball must have worked well because when (heavier) four-stroke motors came along, the hull was already suited to them. Spinning a pair of 23in-pitch Suzuki props, we recorded a top speed of 44.6 knots, which is pretty quick, but substantially slower than some other Voyagers I’ve ridden in before, and more than fast enough in a sensible world. There was another test I wanted to conduct, and that was to run the Voyager with one outboard tilted clear of the water. Full credit to the single Suzuki four-stroke for getting us up and away in reasonable time and ultimately delivering a top speed of just over 30 knots. Even in the unlikely event of an engine failure, this Voyager will still bring you home in comfort and style. It’s impossible to avoid wondering aloud how a boat long thought to be one of the ultimate trailerable offshore fishing vessels in this country stands in today’s world. And it has to be said that Voyager loses absolutely nothing in comparison with the best locally built and imported boats. Even if some of them were little more than a twinkle in some marine architect’s eye when the Voyager was already wowing us.